You will receive two products. You can use these cards in a variety of ways. 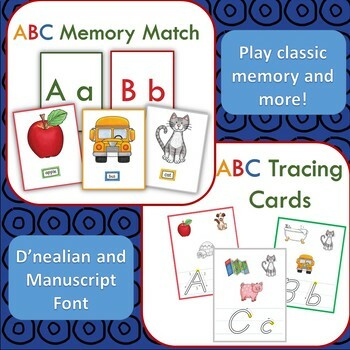 •You can have your student match beginning sounds with all the cards face up. Start with only a handful of cards and keep adding more as your child’s confidence and skill level increases. •You can play memory with them. Again, you do not need to use all the cards at once. Just pick out as many pairs as you desire to start with. You have a lot of options here. 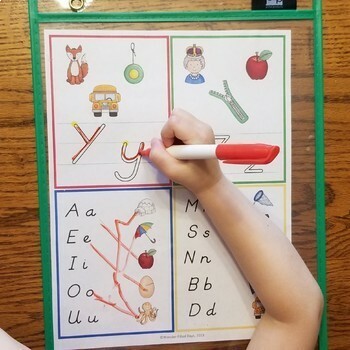 Both hand-writing versions come with an option of having starting dots and arrows next to the letters to guide students when tracing, or you can choose just plain letters. These cards are meant to be printed out double-sided, cut out, and laminated if you desire. You could then put the cards on a ring for organization. I recommend printing on card stock otherwise you will be able to see through. You could also just print out just the pages with the images and use them in dry erase pockets. 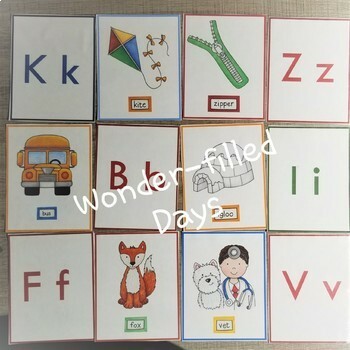 Children can practice tracing the letters and circling the object that starts with that letter.